Trump administration to launch new Earth observing satellite this week | Watts Up With That? While climate caterwaulers are ridiculously complaining the Trump administration is blocking new Earth observing satellites from being launched, we find one is on the launch schedule for November 10th. 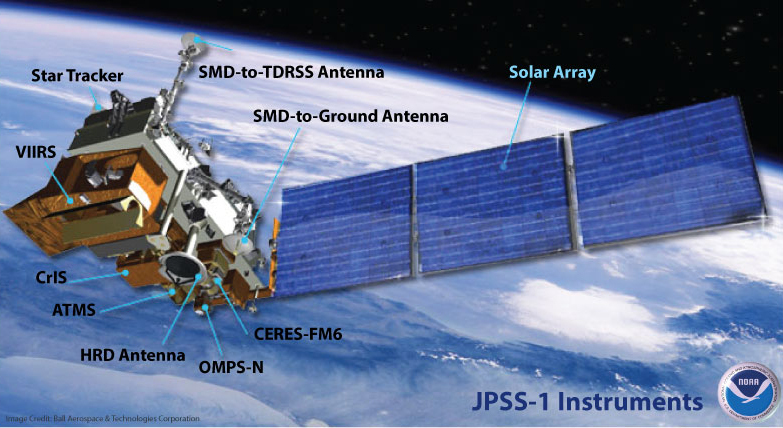 Following launch, JPSS-1 will join Suomi NPP, the joint NOAA-NASA weather satellite giving the United States two, highly sophisticated satellites, each circling the Earth 14 times a day, providing full, global observations for U.S. weather prediction. Suomi NPP, which initially was planned as a research and risk reduction mission when it launched on October 28, 2011, became NOAA’s primary operational satellite for global weather observations on May 1, 2014. Ball Aerospace designed and built the JPSS-1 satellite bus and Ozone Mapping and Profiler Suite instrument, integrated all five of the spacecraft’s instruments and performed satellite-level testing and launch support. Raytheon Corporation built the Visible Infrared Imaging Radiometer Suite and built the common ground system. Harris Corporation built the Cross-track Infrared Sounder. Northrop Grumman Aerospace Systems built the Advanced Technology Microwave Sounder and the Clouds and the Earth’s Radiant Energy System instrument. NOAA works in partnership with NASA on all JPSS missions, ensuring a continuous series of global weather data to secure a more “Weather-Ready” Nation. November 6, 2017 in Space, Technology. Hopefully they will get this up and running before current satellites fail. Unless there is a solid period of cross-calibration it will be starting from zero again. I hope that Mt Agung will hold on long enough for this ozone mapping to be put in place. That may give a better estimation of the warming effects of major eruptions caused by ozone depletion. It will also show that Monreal Protocol was not the Earth saving agreement it is claimed to be. Ozone has been recovering because there have been no major eruptions since 1991. Will give us all sorts of new, useful data, but will they use it in a new and useful way instead of trying to push alarmism with it? Nice. Now we really need for RSS to stop trying to reconcile satellites and GISS temperatures. Having good data and “correcting” it has been a bit of a problem. exactly….this monkey rocket is going to have to be tuned…calibrated….what exactly are they going to calibrate it against? UAH (and formerly RSS) were quite close to radiosondes. The major “surface” temperature reports have so much infill as to be FUBAR. I’m sure they’ll claim the only reason the Trump Administration is allowing the satellite to be launched is that one of Trumps thumbs has been amputated and is being placed on the scale. They don’t think, they just emote. Roy Spencer covered this and more today on his blog. There never was going to be loss of arctic sea ice coverage. The Guardian article is a pure example of fake news. Imo, fake news stories are reaching to new levels of absurdity and deception. The recent Sec. Wilbur Ross/Russia collusion story is another example of a completely false story line being spun out of almost thin air. Ross has shares in an investment group which then did business with a Russian consortium. That makes Sec Ross, Putin’s best friend according to the left leaning media = NBC and such. They have no shame in printing this garbage to feed those who take in every word as the gospel truth. I view this extreme fake news as potentially dangerous to the nation as it is stoking a deep divide within the nation. And all over nothing but lies/propaganda. The latest fish feeding scandal is an excellent example of how the MSM spins the news. They show a clip of Trump dumping some fish food into a koi pond with the text that Trump grew bored and just dumped an entire box onto the poor delicate fish. Of course the entire video shows Trump following the example of Japan’s president. As always, truth and left wing activism, never in the same room at the same time. Of course, the “Trump Administration” launched no satellites — Trump probably doesn’t even know about it at all — maybe one of his cabinet ministers know. This is a NOAA satellite launched by NASA, and has been in planning and progress for years. Climate Whiners spread fake news at every opportunity — and anti-Trump forces spread even more — mostly out of ignorance. 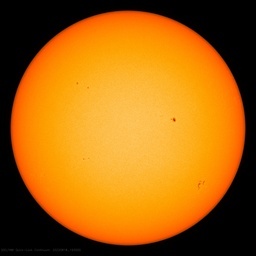 Climate alarm — One small step for Mann, one giant leap backwards. Why continue to launch satellites when they will either ignore or change the data? We are beginning to process the ATMS data from the Suomi/NPP satellite, which now has over 6 years of data. We hope it is at least as good as AMSU. There will need to be 2-3 years from JPSS-1 before it’s worth including in the UAH dataset. The Arctic has always been important for the weather in northern Europe/Atlantic/USA. Thats why the germans tried to uphold a weatherstation in Greenland during WW2. Lets have more real observations from the poles, so that the ice free meme gets a relief. Update —– Launch delayed to November 14th due to a battery problem. Clearly more Trump sabotage. Hey, Musk is battery guy ! !